As a kid, my fear of heights occasionally made me pass on opportunities for adventure. As an adult, it has been a struggle that I have tried to manage. There are a few points when my fear of heights have stood out. Amusement parks have long given me pause on some rides, especially ferry wheels no doubt due to a childhood ride that scared me and yet others found rockin’ that basket so much fun. My sister gave me a break years ago and didn’t make me ride a skybasket to the top of a mountain we wanted to go to. The traffic coming down in the car took forever and I have really pushed myself since. I have successfully ridden quite a few since then. All of my daydreams about going to Cappadocia, Turkey had prompted searching for info and seeing photos. It was amazing how many of those photos included hot air balloons. If you don’t believe me, just hit Google up for an image search on the region. Over time, those images became synonymous with seeing Cappadocia. I mean just look at this. Isn’t that the stuff of daydreams? You see the magnificent colors of the Red Valley, the great blue sky and pops of color here and there of the balloons. But this photo was taken from the ground. I knew I could take those… the question was whether or not I could get up the nerve to make the flight happen. I asked a couple of friends who recently took a balloon ride for their take and Danyelle said go for it while Raijean was really reserved. By the time I got on my flight to Turkey though, I had decided, I simply had to do it. 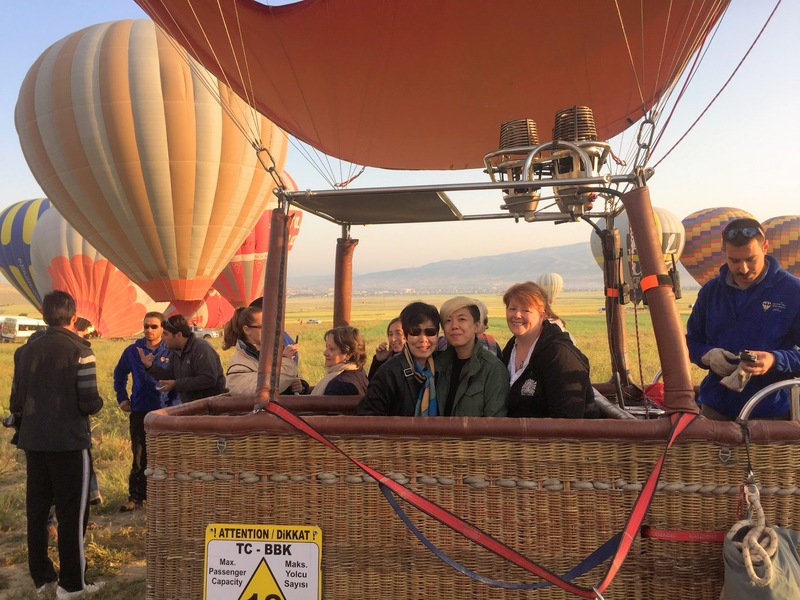 There was no way I could leave Cappadocia without getting airborne so I watched the weather forecasts and decided to take a ride on Tuesday morning. My travel agent (Vedat from Artun Travel) made all the arrangements so all I had to do was get up early and wait for the bus to pick me up. The company I flew with was Atmosfer Balloons and I was happy to see friends from Singapore who I’d met on the previous day’s tour. 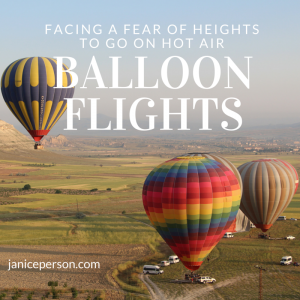 As we winded around Cappadocia, picking up a few more people for the trip, we would occasionally catch some of the balloons from the first wave in dawn’s light. It was magical. Every one of us would whip around to snap photos through the van’s windows and you heard the oohs and ahhs. Though the group discussed whether or not anyone had been in a hot air balloon ride before and some of us confessed to being a tad bit afraid of heights. But I didn’t once have second thoughts. 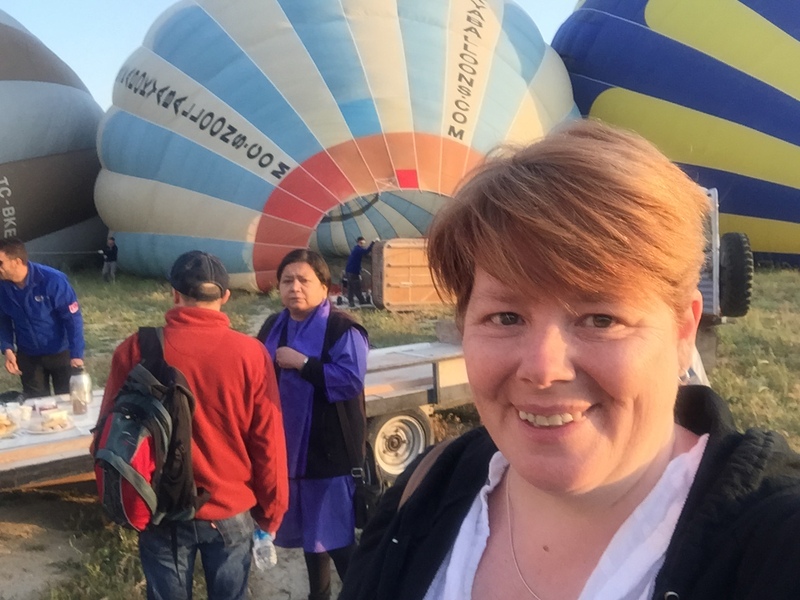 In fact, I was smiling so much and so into it all that I was the first to hop in the balloon! Being first in, meant I was going to be flying next to our pilot Oguzhan Ayata. I decided to get video of the first few minutes in the balloon as we got our bearings, instructions on how we’d hold on and what direction we’d face as we landed, etc. One of the grounds crew grabbed the camera for a bit to get some video of us too! As you can see, the excitement of the adventure totally kept any fear of heights at bay! Think it was shear power of the mind wanting this experience and having an awesome pilot didn’t hurt! I’ll have to write another post about the rest of the experience…. and I have a lot of video and photos to go through for that post! Hope you enjoy this little glance into the experience and come back for more soon. Don’t forget there are lots of posts I’ve already written about my vacation to Turkey, feel free to check those out. I can spend a lot of time soaking it up! It’s almost always a colorful adventure!